Web 2.0 software technologies such as blogs, SNS and RSS regard the web itself as a platform. Amazon, Google and Yahoo! deliver information in XML format through their web services. Standard XML data can be viewed, modified and operated freely. Therein lies the biggest strength of these Web services. 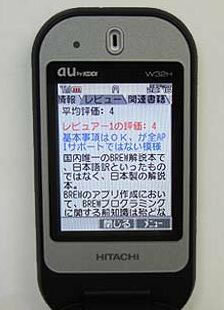 Now BREW enabled mobile phones are able to wirelessly access these Web services. The C++ WSDL/SOAP/XML libraries have now been added to SophiaFramework 4.0. The World's First XML Parser for BREW "pself"
"pself" is the world's first XML Parser for BREW to support DTD and XML schema. Its source code was developed using SophiaFramework UNIVERSE. Its implementation is in keeping with the API of Microsoft's XML Parser for C++ ( Microsoft XML Core Services (MSXML) 4.0 ). Therefore, pself allows Web service applications for BREW to be coded smoothly in C++, on Windows. Amazon.co.jp offers functions that allow book searches and purchases to be performed online. The "Bookshelf Application" presented here is a BREW application which uses pself to instantly display information about books available on Amazon.co.jp on a BREW enabled mobile phone. URL Used to Obtain Book Information from the Amazon Web Server. * URL should be written without line breaks. Enter your Subscription ID in "[Subscription ID]". You can get your subscription ID when registering for Amazon Web services. Enter the ISBN number in "Power = isbn: ". The window below is displayed when the URL is accessed using a PC browser. For instance, <Author> found in <ItemAttributes> represents the author's name and <Title> is the book's title. HTTP communication with Amazon is achieved through the SFXHTTPConnection class of SophiaFramework UNIVERSE. Before the inbound data can be delivered to pself, it is first saved to the file "amazondata.xml" using the SFXFile class of SophiaFramework UNIVERSE. // Error handling is ommited. Development and the maintenance are both facilitated by the XML data structures being fed directly into the source code. A book's essential information like title, author, image, price, contents, summary, reviews can be presented clearly on a mobile phone display with the proper original GUI. The development of this GUI will be significantly reduced thanks to SophiaFramework UNIVERSE's GUI framework. It provides an infrastructure specifically for BREW mobile phones that needs only to be customized for each application. // Display text in 1st tab. By using pself and SophiaFramework UNIVERSE, the "bookshelf GUI application" with tab control was completed with a minimum amount of coding.